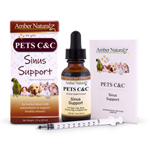 Excellent natural organic pet care kits for Emergency, Preventative, & Non-Emergency use situations. Need a natural pet care kit that travels easily in a nice pouch, so you can take it in your car, to shows, to the park, hiking, or just leave in your house with all the ingredients you need for emergency needs, disease prevention, and non-emergency situations? 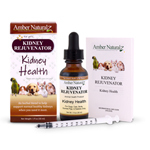 This natural herbal PET HEALTH CARE KIT is great for your dog and puppy or your cat and kitten. 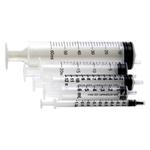 The CANINE CARE KIT is made specifically for dogs and puppies and the FELINE CARE KIT is for cats and kittens. This kit is easy to carry and travels easily anywhere you and your pets go. Amber Tech has created these natural Pet Health Care Kits for your canine and feline because they recognize the emotional attachments you place upon your dog, cat, and other furry pets and wants to provide the support and tools needed to help keep your pet with you for a long healthy life time. The PET CARE KIT contains products formulated to help your pet overcome illnesses such as Parvo, Feline Distemper, Kennel Cough, Coccidia, Giardia, and the Canine Flu. The PET CARE KIT also has an immunity enhancement to give added protection from the diseases cats and dogs are suceptible to as well as reduce free radicals and stimulate circulation which are important to the system for optimum health. 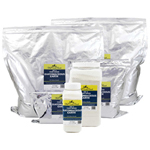 The PET CARE KIT has products that help natural processes of detoxification, elimination, oxygen carrying capabilities, circulation, immune function, & cellular regeneration, making this kit beneficial to the system for its ability to keep toxins out of the body as well as eliminate illnesses from the lymphatic system. The PET CARE KIT includes 1 oz. bottles of: Paxxin (formerly Parvaid) (for dogs) OR Kitty Distempaid (formerly Kitty Distempaid) (for cats), Vibactra Plus, Vintesta (formerly Pet's Cough & Cold Formula), Life Cell Support; 2 dram bottles of UTR (formerly Urinary Tract Relief) and Kidney Rejuvenator (feline kit) or 2 dram bottles of Adizone and Kidney Rejuvenator (canine kit); 5 cc syringe, bandaids, and leash. The PET CARE KITS have a 4 to 6 year shelf life. PET CARE KITS make excellent gifts! 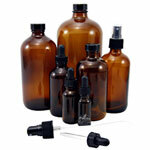 Here are all of the organic herbal products that are in the Pet Care Kits. 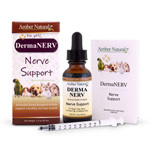 Note: Feline Care Kits have Kitty Distempaid and the Canine Care Kits have Parvaid.